IRRESISTIBLE IN LOVE is now available for pre-order! Evan Collins is the man with the Midas touch. Having left his hard childhood behind him, the tech genius vowed to one day have everything. 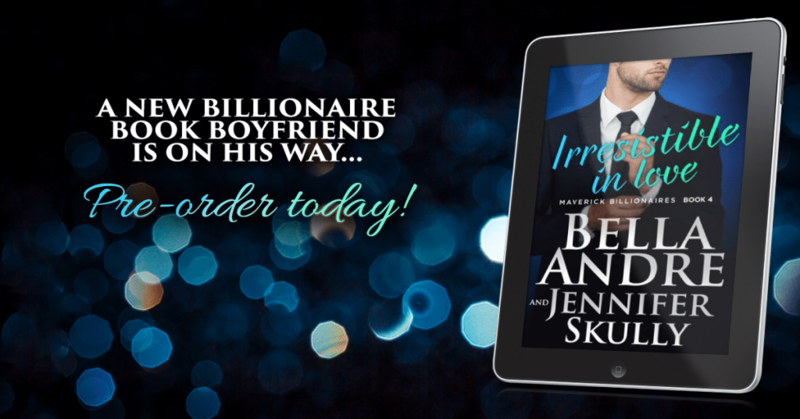 But when he discovers that his marriage is built on lies, the only people he can trust now are the Mavericks—and the woman who has always been there for him: Paige, the sister of his soon-to-be ex-wife. Paige Ryan has always loved Evan Collins, a secret she’s hugged close to her heart for nine long years. But when her sister’s devastating betrayal is revealed, Paige can’t keep her feelings hidden any longer. Paige is a beacon of light for Evan. Despite believing he needs to keep the walls around his heart stronger than ever, he’s irresistibly drawn to her sweet, pure heart—and the undeniable sparks flaring between them. She’s the only one he trusts to help him face the darkness of his past head-on before it destroys him. But will their forbidden romance end up destroying them both? When will the third Morrison book, Love Me Like This, be coming out? So in love with your books!